A homeowner who seemingly had enough with neighborhood problems took his concerns to the Elk Grove City Council meeting on Wednesday, February 25. The resident described a street plagued by a rental that has in his description has been occupied at times by up to 22 people. Additionally, the resident claimed that the house has generated numerous complaints that have been handled by the City of Elk Grove code enforcement staff and the Elk Grove Police. The most egregious claim was that as a result of this residence, one of his neighbor's house was hit a bullet coming from one of the occupants, or as a result of an occupant to the dwelling. "We need the City Council's help," he noted. 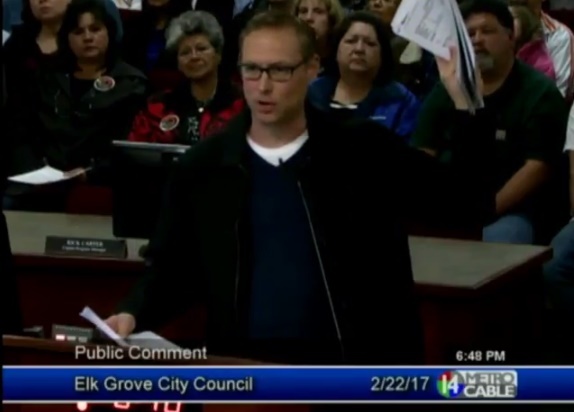 After hearing the complaints, the Elk Grove City Council said they would look into the matter and see if there was a way to rectify the situation.